School closures across Michigan are on the rise because of the extreme winter weather of the last few weeks. Lots of people are worrying about the possibility of make-up days at the end of the year. 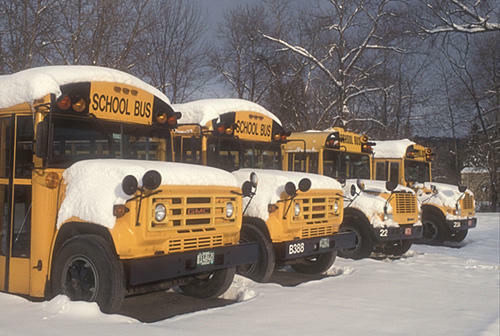 State Representative Ben Frederick (R-Owosso) is one of the lawmakers proposing plans to help school districts that exceed the annual nine day limit on snow days. "The legislation I'm introducing this week would exempt snow days which occur during a state of emergency from the allowance that's given to schools every year," said Frederick. "In the extraordinary event of a state of emergency, schools shouldn't be penalized by having those days count against their bank," he said. "I do trust our local schools and our local teachers to structure curriculum and make up work and maybe home-based assignments to ensure that the content is delivered," said Frederick. "So I do feel there are tools available that would allow the time if you will, the snow days, to be made up without necessarily having to resort to extension of the school year." Governor Gretchen Whitmer signed a statewide state of emergency on January 28, 2019 to respond to dangers posed by sub-zero temperatures. Under state law, Michigan school districts must provide at least 180 days of instruction each year. The law allows districts to close for a total of six days for events beyond the control of school authorities, such as severe storms, fires, power outages, or health threats. These kinds of cancellations are commonly referred to as snow days. The districts can ask the state superintendent to approve up to three more days of "forgiven time" after the first six days have been exhausted. "Beyond those limits in state law - the nine days total, three with permission - they have to start looking at making up time, typically at the end of the year," said Bill Disessa, a spokesman for the Michigan Department of Education. "If they don't do that, they risk losing the corresponding amount in state aid." "We've had 74 local districts that have requested 'forgiven time' so far," said Disessa. "Now that's as of now. That number's going to go up." Grand Rapids Public Schools have already had ten days worth of closures because of the recent severe weather. Michigan Radio's Dustin Dwyer talked to Morning Edition host Doug Tribou about the power outages. Consumers Energy says it expects to have power returned to all customers by midday Monday. The utility company says it’s already restored power to more than 200,000 customers since last week’s ice storms. But the recovery isn’t over in the hardest hit parts of West Michigan. West Michigan residents are expecting another winter storm, and that could mean more power outages. More than 230,000 people in Michigan lost power last week, most of them living on the west side of the state. Restoration crews have been working around the clock to remove tree branches and fix power lines. Governor Gretchen Whitmer declared a state of emergency for the city of Grand Rapids over the weekend due to last week's winter weather.